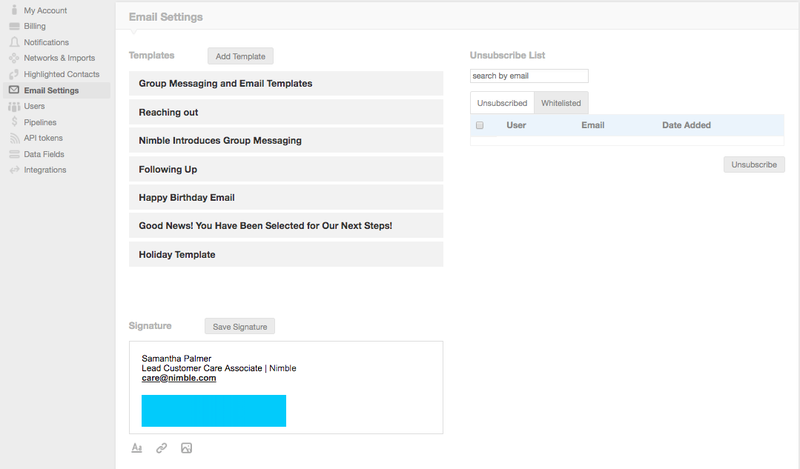 Setup multiple templates, a signature and unsubscribe/whitelist contacts all within Settings >> Email Settings. To create several email templates, click "Add Template". This will bring up our template editor, where you can insert all of your email fields, including attachments and merge tags. Once you create a template, it will be available beneath the "Select Template" option on the Group Message screen. Templates are also available on a contact record when using "Send Message". It is best to create your templates in Nimble or within a Google Doc. When copied and pasted, some systems such as Microsoft Word have been known to cause strange characters to appear in the body of an email after it is sent. You can always test whether these characters will appear by first sending a test message to yourself. Templates must not be written in HTML and must be text only. 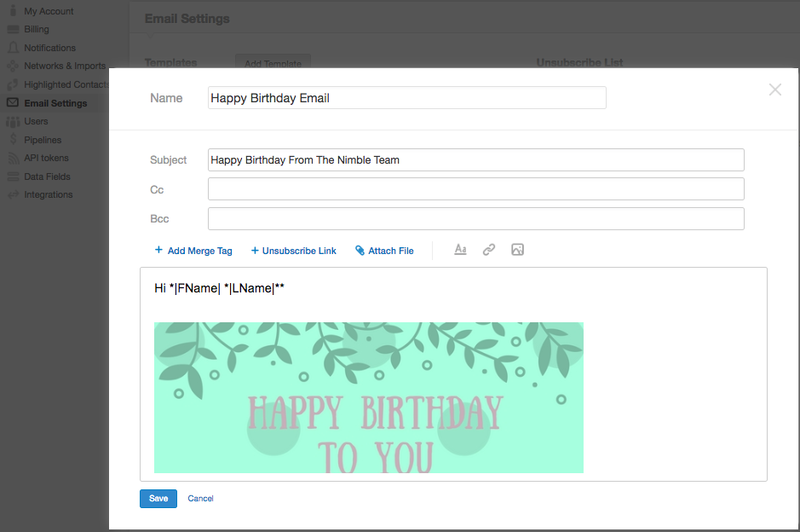 In Nimble, you can create hyperlinks, add images, and customize your fonts. Please note that Nimble does not provide preset templates, however, our team may consider this in the future. Feel free to reach out to us at care@nimble.com and share your feedback. Easily create an email signature for your individual and group messages. You can easily insert an image from your desktop, customize your fonts and include hyperlinks without needing to code in HTML. Also, if you already have a signature in Gmail, Outlook, Apple Mail, or another email client, all you'll have to do is copy and paste it into Nimble. For any bulk email outreach, it's polite and important to give your recipients the ability to opt-out. With GDPR and CAN-SPAM, an opt-out needs to be included in any of your unsolicited email outreaches. When someone unsubscribes from your emails, you will no longer be able to send Group Messages to them at that specific email address. You will still be able to send a one on one email to this contact, but the purpose of the unsubscribe button is to give bulk email recipients the option to opt-out. The "Unsubscribe List" visible in your Email Settings, will display all contacts who have unsubscribe from your bulk email outreaches. 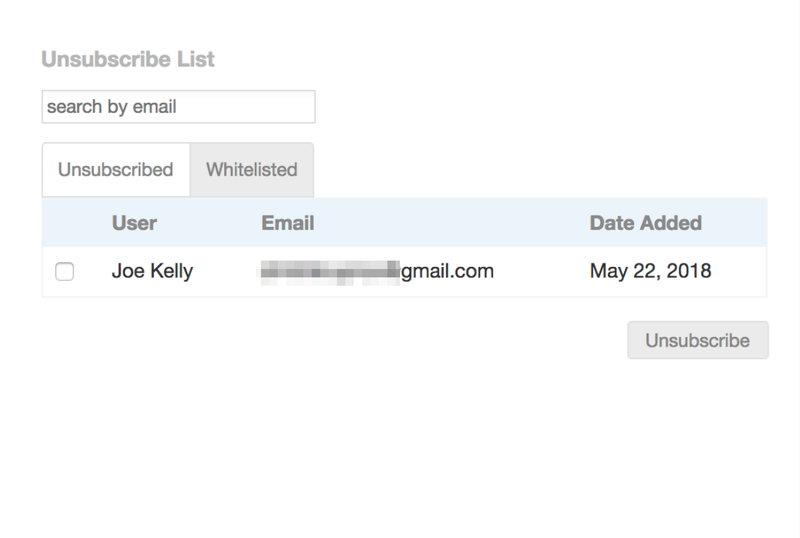 If someone explicitly asks to be resubscribed, you may whitelist their email to add the user back to your bulk email communications. To learn more about this feature, take a look at the following: How do I unsubscribe contacts from receiving emails?